The Tennessee Titans and the Houston Texans in formation before a play. Game play in American football consists of a series of downs, individual plays of short duration, outside of which the ball is dead or not in play. These can be plays from scrimmage – passes, runs, punts, or field goal attempts (from either a place kick or a drop kick) – or free kicks such as kickoffs and fair catch kicks. Substitutions can be made between downs, which allows for a great deal of specialization as coaches choose the players best suited for each particular situation. During a play, each team should have no more than 11 players on the field, and each of them has specific tasks assigned for that specific play. The objective of this game is to score more points than the other team during the allotted time. The team with the ball (the offense) has 4 plays (downs) to advance at least 10 yards, and can score points once they reach the opposite end of the field, which is home to a scoring zone called the end zone, as well as the goal posts. If the offense succeeds in advancing at least 10 yards, they earn a "first down" and the number of tries allotted is reset and they are again given 4 tries to advance an additional 10 yards, starting from the spot to which they last advanced. If the offense does not advance at least 10 yards during their 4 downs, the team without the ball (the defense) regains control of the ball (called turnover on downs). The offense may attempt a field goal kick which is worth 1 point. The offense may attempt to re-advance the ball into the opponent's end zone for a two-point conversion worth 2 points. While the opposing team has possession, the defense attempts to prevent the offense from advancing the ball and scoring. If an offensive player loses the ball during play (a fumble) or the ball is caught by a defensive player while still in the air (an interception), the defense may attempt to run into the offense's end zone for a touchdown. The defense may also score points by tackling the ball carrier in the offense's own end zone, called a safety (which is worth two points). Collegiate and professional football games are 60 minutes long, divided into four quarters of 15 minutes each. In high school football, 12 minute quarters are usually played. The clock is stopped frequently, however, with the result that a typical college or professional game can exceed three hours in duration. The referee controls the game clock and stops the clock after any incomplete pass or any play that ends out of bounds. In addition, each team is allowed 3 timeouts in each half that they may use at their own discretion. The clock normally runs during the action of plays, with a few exceptions known as untimed plays. The clock may also be stopped for an officials' time-out, after which, if the clock was running, it is restarted. For example: if there is a question whether or not a team has moved the ball far enough for a first down, the officials may use a measuring device (the chains) to determine the distance. While this measurement is taking place, the officials will signal for a stoppage of the clock. Once the measurement is finished and the ball is placed at the proper location (spotted), the referee will then signal for the clock to restart. Additional situations where officials may take a time-out are to administer a penalty or for an injured player to be removed from the field. In addition to the game clock, a separate play clock is also used. This counts down the time the offense has to start the next play before it is assessed a penalty for delay of game (see below). This clock is typically 25 seconds from when the referee marks the ball ready for play. The NFL and NCAA use a 40-second play clock that starts immediately after the previous play ends, though for certain delays, such as penalty enforcement, the offense has 25 seconds from when the ball is marked ready. The purpose of the play clock is to ensure that the game progresses at a consistent pace, preventing unnecessary delays. Overall, clock management is a significant part of the game; teams leading toward the end of the game will often try to run out the clock, while trailing teams attempt the opposite. Officials also call for media time-outs, which allow time for television and radio advertising. They also stop the clock after a change of possession of the ball from one team to the other. Successful PATs (Point(s) After Touchdown), a field goal try, or a kickoff may also warrant stopping the clock. If an instant replay challenge is called during the game, the referees signal for a media time out. The referee signals these media time-outs by first using the time out signal, then extending both arms in a horizontal position. Teams change ends of the field at the end of the first quarter and the end of the third quarter, though otherwise the situation on the field regarding possession, downs remaining and distance-to-goal does not change at these occasions (so a team with possession 5 yards from the opponent's endzone at the end of the first quarter would resume play 5 yards from the endzone at the other end of the field, which they would then be attacking) . Separating the first and second halves is halftime. Both halves, and any overtime, begin with kick-offs — the kicking team is decided by a coin toss (see below). In the NFL, an automatic timeout is called by the officials when there are two minutes left in both the second and the fourth quarters, and overtime; this is most commonly referred to as the two-minute warning. No such warning is normally given in amateur football, though if there is no visible stadium clock, the referee will give a two-minute warning (four minutes in high school). If a game is tied at the end of four quarters, overtime is played. In overtime, the coin is tossed to determine which team will possess the ball first. The winner of the coin toss can choose to give the ball or receive the ball. If the first possession results in a field goal, the other team is given possession to match or better the field goal; therefore continuing the game. If the first possession results in a touchdown or safety, the scoring team wins. During the regular season in the NFL, one overtime period is played (with each team receiving two time outs). If both teams are tied after the 10-minute overtime, the game officially ends in a tie. In the playoffs, 15-minute overtime periods continue until a winner is determined. Overtime follows a three-minute intermission after the end of the regulation game. Prior to start of overtime, a coin flip is performed in which the captain of the visiting team calls the toss. The team that wins the coin flip has the option either to receive the kickoff or choose the side of the field they wish to defend. Ties are rare in the NFL; a game between the Minnesota Vikings and Green Bay Packers on September 16, 2018 ended in a 29–all draw. The previous occurrence was one week earlier, on September 9, 2018. Prior to the 2010 playoffs, the overtime winner was simply the first team to score any points; however, the rules were changed to reduce the apparent advantage obtained by the team that won the overtime coin toss. Under the prior rules, the team that won the coin toss would usually elect to receive the ball, then gain just enough yardage to win the game by kicking a field goal without the other team ever touching the ball. The coin toss winner won approximately 60% of overtime games under that rule. The first overtime game played under a trial of the new overtime rules occurred in the 2011–2012 NFL AFC Wildcard Playoff game between the Denver Broncos and Pittsburgh Steelers at Sports Authority Field at Mile High, Denver, Colorado. Denver won the game on the first play in overtime, an 80-yard touchdown pass from Tim Tebow to Demaryius Thomas. The rule was formally adopted for the 2012 season, and the first game in which both teams scored in overtime was a 43–37 victory by the Houston Texans over the Jacksonville Jaguars on November 18, 2012. The rules for overtime changed for the 2016–2017 season and were tweaked again for the 2017–2018 season. The NFL's overtime rules are still subject to criticism, as a team that loses the coin toss and goes on to conceded the touchdown does not get a chance for their offense to take the field. Super Bowl LI was the first Super Bowl to go into overtime with a 28-all tie between the Atlanta Falcons and New England Patriots, which the Patriots eventually won with James White scoring a touchdown on the Patriots' first drive. The 2018-19 NFC and AFC championship games both went to overtime, the first time for such an occurrence. In the NFC title game, the New Orleans Saints won the coin toss but an interception allowed the Los Angeles Rams to drive into range to kick the winning field goal. In the AFC Championship held later that day, the New England Patriots won the coin toss and on their first drive scored the winning touchdown over the Kansas City Chiefs. NFL Europa, a defunct league run by the NFL, used a 10-minute overtime period, with the constraint that each team must have the opportunity of possession; once both teams have had such an opportunity, the overtime proceeds in a manner similar to the NFL's. Thus, if Team A has the first possession of overtime and scores a touchdown and converts their kick (thus being 7 points ahead of Team B), Team A would then kick off to Team B (In the NFL, the game would have ended with the touchdown, without a conversion being attempted). Team B would have to match or exceed the 7 point difference within this ensuing possession; exceeding it would end the game immediately, while matching the difference would result in a kickoff to Team A. From this point, the overtime is sudden death. The defunct United Football League had also used this rule. The defunct World Football League, in its first season of 1974, used an overtime system more analogous to the system long used in international soccer. The overtime consisted of one 15-minute period, which was played in its entirety and divided into two halves of 7½ minutes each, with each half starting with a kickoff by one of the teams. The league changed to the NFL's sudden-death format for its final season in 1975. In college and high school football, an overtime procedure (the Kansas plan) ensures that each team has equal opportunity to score. In college, both teams are granted possession of the ball at their opponents' 25 yard-line in succession. A coin flip takes place, with the winning team having the option either 1) to declare that they will take the ball first or second, or 2) to decide on which end of the field the series will occur (both teams' series occur on the same end of the field). The losing team will have the first option in any subsequent even-numbered overtime. In the first overtime, the team with first series attempts to score either a touchdown or a field goal; their possession ends when either a touchdown or a field goal have been scored, they turn the ball over via a fumble or an interception, or they fail to gain a first down. After a touchdown, a team may attempt either an extra-point or a two-point conversion. However, if the team on defense during the first series recovers a fumble and returns it for a touchdown, or returns an interception for a touchdown, the defensive team wins the game. (This is the only way for a college overtime game to end without both teams having possession.) Otherwise, regardless of the outcome of the first team's series (be it touchdown, field goal, or turnover), the other team begins their series. If the score remains tied after both teams have completed a series, a second overtime begins. If the score remains tied after two overtimes, teams scoring touchdowns are required to attempt a two-point conversion from the third overtime on. Just as in regulation, if a defensive team recovers a fumble/returns an interception to the end zone during a two-point conversion attempt, they will receive two points. In high school football, individual state associations can choose any overtime format they want, or even elect to not play overtime at all (ties stand in this case). However, most states use the Kansas Plan. In a majority of states, each team is granted possession of the ball at the 10-yard line, meaning that a team cannot make a first down without scoring except via a defensive penalty that carries an automatic first down (such as defensive pass interference or roughing the passer). As is the case with the college overtime rule, the team that wins the coin toss will have the choice as to whether to take the ball first or second, or decide at which end of the field the overtime will be played. The other major difference between overtime in college football and high school football is that in high school football, if the defense forces a turnover, the ball is dead immediately, thus eliminating the possibility of scoring. However, in Texas, the college overtime rule is used, as both the University Interscholastic League, which governs interscholastic activities for Texas public high schools, and the Texas Association of Private and Parochial Schools, the largest analogous body for Texas private high schools, play by NCAA football rules with a few modifications for the high school level. Massachusetts also is another state that uses NCAA-style overtime rules. The defunct XFL used a modified Kansas Plan which, upon the first team scoring, required the opponent to score the same or greater number of points in the same or fewer downs (i.e., if the first team scored a touchdown, and converted the one-point conversion in three downs, the opponent would have to match that touchdown and conversion in three downs as well). Each team started at the 20-yard line, but like high school, there were no opportunities for first downs. The league also banned field goals except on a fourth down. Cecil D. Haney flips the coin at the 2013 Pro Bowl. The loser of the toss gets the remaining option. At the start of the second half, the team that did not choose first (either because they deferred their choice or because they lost the toss) gets the first choice of options. According to USA Today, in college games, the team that wins the toss defers their choice to the start of the second half over 90% of the time. If a game goes to overtime, a coin toss is held before the start of overtime, but tosses are not held before the start of subsequent overtime periods. In college, for example, the loser of the toss to start overtime has first choice in the second overtime period. The choices available to the captains in overtime vary among the NFL, college, and various states' high school rules. The XFL did not implement a coin toss; instead an event took place called the "opening scramble", in which one player from each team fought to recover a football 20 yards away to determine possession. Both players lined up side-by-side on one of the 30-yard lines, with the ball being placed at the 50-yard line. At the whistle, the two players would run toward the ball and attempt to gain possession; whichever player gained possession first was allowed to choose possession (as if he had won a coin toss in other leagues). Contact by an opponent (called down by contact) where the opponent tackles the runner by pushing him, grasping him and pulling him to the ground, sliding into his legs, or touching him in any manner prior to any part of the runner other than his hands or feet touching the ground. Unlike the use of the word tackle in other sports, if the opposing player fails to down the ball carrier, it is merely an attempted tackle. If the ball carrier falls onto another player but he doesn't make contact with the ground, he can still get up and keep playing. A player on the ground is not considered part of the ground. Intentionally downing the ball: intentionally kneeling, verbally declaring "I'm down" (except in college), or similar actions. For example, to protect himself from violent hits by opponents attempting to tackle him, the quarterback may choose to slide to the ground feet-first. This slide is interpreted as intentionally downing the ball, and opponents may then be penalized for hitting him. In amateur football, a runner is downed when any part of his body other than his hands or feet touches the ground at any time (unless he is the holder for a place kick). In professional football, the runner is not down for such accidental contact; he must be down by contact with an opponent as described above. The runner goes out of bounds: that is, any part of his body (including his hands or feet) touches the ground, or anything other than another player or an official, on or past a sideline or an endline. Note that the sideline itself is out of bounds, so that the runner is deemed out of bounds if he steps on or touches any part of it. Note also that a runner may carry the ball in such a manner that it is over the sideline, so long as the ball or runner does not touch anything out of bounds. The runner's forward progress toward the opponents' goal line is stopped by contact with an opponent, with little chance to be resumed. The exact moment at which the player's forward progress stops is subject to the judgment of the officials. In particular, for the protection of the quarterback, he is considered down as soon as an official judges that he is in the grasp of an opponent behind the line of scrimmage, and the tackling defensive player(s) will be awarded with a sack. If he is driven backward by the opponent, the ball will be spotted where his forward progress was stopped. The majority of a football game takes place on plays, or downs, that begin at the line of scrimmage. The officials spot the ball (place it in a designated spot on the field) on the line of scrimmage and declare it ready for play. The width of the spotted football defines the width of the neutral zone, an area of the field no player other than the snapper may position himself in or above before the snap. Each team has its own line of scrimmage, thought of as a vertical plane from sideline to sideline that passes through the point of the ball nearest its own goal line. A formation at the line of scrimmage. Offensive players are marked by O symbols, defensive players by X symbols. 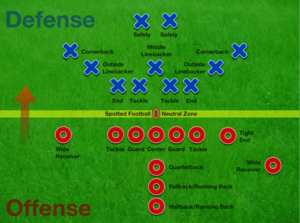 This diagram shows two of the most common formations, the offense is in the I formation while the defense is in the 4–3 formation. There are many different formations the players may take. A typical offense is made up of a quarterback, five offensive linemen, two wide receivers, a running back, a fullback, and a tight end, however teams will vary their personnel on the field to fit any given play. A quarterback is essentially the leader of the offense. It is most often their responsibility to pass along the play called to the rest of the players in the huddle before any given play. A quarterback is the primary ball handler on offense. It is their responsibility to call the snap count for the ball to enter play. Once the ball is hiked into play, it is their job to either hand the ball off to one of their running backs, or scout the field for an open receiver to throw the ball to. In some instances, the quarterback will run the ball themselves. A quarterback is guarded by their offensive linemen. The offensive line is made up of a left and right tackle, a left and right guard, and a center. It is the center's responsibility to hike the ball to the quarterback. An offensive line has two different jobs. When the offense runs a pass play, it is their job to guard the quarterback from the defense that are rushing. When the offense runs a run play, it is their job to clear a path for the running back to run through. The running back also has multiple roles. They will either take the ball from the quarterback and run, move up and help the offensive line block, or go out and catch a pass. While the role of the fullback is deteriorating currently among professional leagues, it is their primary responsibility to lead the running back. Running backs and fullbacks are sometimes also called a halfback, a wingback, or a slotback. Like the running back, the tight end also has multiple roles. They will either help the offensive line protect the quarterback, block on run plays, or run or catch the ball themselves. The wide receivers primary role is to run out into the field of play and catch the ball, although they will also block in some instances. The players on offense must arrange themselves in a formation, all behind their line of scrimmage (that is, on their side of the ball). For reasons of safety and competitive balance, there are strict rules which define the way in which the offensive players may line up. Seven players must line up directly on the line of scrimmage while four players line up behind the line of scrimmage. Within this formation, there are six eligible receivers who may receive a forward pass during play. These eligible receivers are either the running back, fullback, tight end, or wide receivers. The remaining five linemen, often called interior linemen do not normally handle the ball during a play. Because of these rules, various leagues of American football have enacted strict rules of uniform numbering so officials may more easily judge which players were eligible and which were not at the start of a play. For example, in college football, ineligible players wear numbers 50–79, while eligible receivers wear 1–49 or 80–99. Even within this structure, offenses can still present a wide number of formations, so long as they maintain the "seven and four" arrangement. Receivers, for example, may play close to the other linemen or they may play some distance down the line of scrimmage, where they would sometimes be called split ends. Of the four backs, they may play behind the linemen, or may play "split out" to provide additional wide receivers. These additional receivers can be flankers (if they play split far wide, but still in the backfield) or slot receivers if they play in the "slot" between the split end and the rest of the offensive line. The players on defense may arrange themselves in any manner, as long as all players are "behind the line" (that is, on the side of the line nearest their own end zone). Players who line up opposite the offensive line are called defensive linemen, usually with one or two defensive tackles in the middle (a single defensive tackle is often called the nose guard or nose tackle) and with one defensive end on each side. A defensive lineman's job is typically to put pressure on the opposing teams quarterback by rushing the offensive line. The defensive line is also most often the first set of players the opponent must get through should they choose to run the ball. Behind the linemen are the linebackers. A linebackers job can be any number of things, including trying to rush the opposing teams quarterback, stopping the opponents running back on run plays, or covering the opponents tight end or wide receivers. Positioned opposite the wide receivers are the cornerbacks. Their primary responsibility is to cover the wide receivers. Farthest back from the line are the safeties, usually in the middle of the field behind the linebackers. The safeties are the last line of defense against the opponent. Like a linebacker, a safety's role can vary, however their most common role is to help the cornerbacks cover the opponent's wide receivers, which is called "double coverage". The linemen and linebackers close to the line of scrimmage, are often referred to as playing "in the box". Players outside "the box" (usually cornerbacks and safeties) are collectively referred to as the "secondary". A scrimmage down begins with a snap, where the center throws or hands the ball backward to one of the backs, usually the quarterback. The quarterback then either hands the ball off to a back, throws the ball, or runs with it himself. The down ends when the ball becomes dead (see below). The ball is typically next spotted where the ball became dead; however, if it became dead outside the hash marks, it is brought in on the same yard line to the nearest hash mark. This spot becomes the line of scrimmage for the next play. In the case of an incomplete forward pass, the ball is returned to the spot where it was last snapped to begin the next play. A fumbled ball that goes out of bounds is declared dead and possession remains with the team that most recently had control of the ball. under NFL or college rules, on fourth down (or, in the NFL, on any down after the two-minute warning in either half/overtime), a ball fumbled forward by the offensive team is recovered by an offensive team player other than the fumbler. The nearest official typically blows his whistle after the ball becomes dead to alert the players that the down has already ended. If the ball is alive and the official sounds an inadvertent whistle, then the ball still becomes dead, but the team in possession of the ball may elect to have the down replayed or take the spot where the ball was declared dead. If the ball was loose from a fumble, then the ball can be put into play at the spot of the fumble. If the ball was in flight from a kick or a pass, then the down is always replayed. A kickoff is a type of free kick where the ball is placed on a tee (or held) at the kicking team's 35-yard line (40 for high school). In the 2011 NFL Season, changes were made regarding kickoffs to limit injuries. Kickoffs were returned from the 30-yard line to the 35-yard line, repealing a 1994 rule change. In addition, players on the kickoff coverage team cannot line up more than 5 yards behind the kickoff line, minimizing running starts and thus reducing the speed of collisions. The kicking team's players may not cross this line until the ball is kicked; members of the non-kicking (or "receiving") team are similarly restrained behind a line 10 yards further downfield (the 45-yard line, or 50 for high school). A valid kickoff must travel at least this 10-yard distance to the receiving team's restraining line, after which any player of either team may catch or pick up the ball and try to advance it (a member of the kicking team may only recover a kickoff and may not advance it) before being downed (see "Downed player," below). In most cases, the ball is kicked as far as possible (typically 40 to 70 yards), after which a player of the receiving team is usually able to secure possession (since the members of the kicking team cannot start downfield until after the ball is kicked). Occasionally, for tactical reasons, the kicking team may instead choose to attempt an onside kick, in which the kicker tries to kick the ball along the ground just over the required 10-yard distance in such a manner that one of his own teammates can recover the ball for the kicking side. If it is touched before ten yards, the ball is dead and a re-kick or spot of the ball will be rewarded to the receiving team. A member of the receiving team gaining possession of the ball on a kickoff may attempt to advance it as far as he can toward the kicking team's goal line before being downed. Once the ball carrier is downed, the play is whistled dead and the ball is placed by the officials at the point where the play ended; this spot then becomes the line of scrimmage for the ensuing play. A kick that travels through or goes out of bounds within the end zone without being touched, or is caught by the receiving team in the end zone but not advanced out of it, results in a touchback; the ball is then placed at the receiving team's 25-yard line, which becomes the line of scrimmage. A kickoff that goes out of bounds anywhere other than the end zone before being touched by the receiving team is an illegal kick: the receiving team has the option of having the ball re-kicked from five yards closer to the kicking team's goal line, or they may choose to take possession of the ball at the point where it went out of bounds or 30 yards from the point of the kick (25 yards in high school, and in college as of 2012[update]), whichever is more advantageous. A free kick is also used to restart the game following a safety. The team that was trapped in its own end zone, therefore conceding two points to the other team, kicks the ball from its own 20-yard line. This can be a place kick (in the NFL, a tee cannot be used), drop kick or punt. In the NFL and high school, a free kick may be taken on the play immediately after a fair catch; see "fair catch kick" below. A field goal is scored when the ball is place kicked, drop kicked, or free kicked after a fair catch or awarded fair catch (High School or NFL only) between the goal posts behind the opponent's end zone. The most common type of kick used is the place kick. For a place kick, the ball must first be snapped to a placeholder, who holds the ball upright on the ground with his fingertip so that it may be kicked. Three points are scored if the ball crosses between the two upright posts and above the crossbar and remains over. If a field goal is missed, the ball is returned to the original line of scrimmage (in the NFL, to the spot of the kick; in high school, to the 20-yard line if the ball enters the end zone, or otherwise where the ball becomes dead after the kick) or to the 20-yard line if that is further from the goal line, and possession is given to the other team. If the ball does not go out of bounds, the other team may catch the kicked ball and attempt to advance it, but this is usually not advantageous. One official is positioned under each goalpost; if either one rules the field goal no good, then the field goal is unsuccessful. A successful field goal is signaled by an official extending both arms vertically above the head. A team that successfully kicks a field goal kicks off to the opposing team on the next play. A touchdown is earned when a player has legal possession of the ball and the ball touches or goes over the imaginary vertical plane above the opposing team's goal line. After a touchdown, the scoring team attempts a try for 1 or 2 points (see below). A successful touchdown is signaled by an official extending both arms vertically above the head. A touchdown is worth six points, except in the defunct WFL where it was worth seven points. For statistical purposes, the player who advances the ball into or catches it in the end zone is credited with the touchdown. If a forward pass was thrown on the play, the throwing player is also credited with a passing touchdown. A try is more frequently called an extra-point attempt or a PAT (abbreviation of "Point After Touchdown"). Either one or two additional points may be scored during the try. The ball is spotted at the 15-yard line (for 1-point conversions); 2-yard line (for 2-point conversions) for the NFL and on 3-yard line for college and high school, and the team is given one un-timed play to earn points. The offensive team may attempt to kick the ball through the goalposts, in the same manner that a field goal is kicked. If successful, the team is awarded one point, referred to as an extra point. This option is almost always chosen, because a two-point conversion attempt is much riskier. Since the extra point is almost always successful (especially in NFL play), sportscasters will often refer to a team up or trailing by seven (not six) points as being "up/trailing by a touchdown". The offensive team may attempt to advance the ball via run or pass into the end zone, much like a touchdown on the extra-point attempt, except that it receives two points. This is called a two-point conversion. The success rate for two-point conversions is about 48 percent in the NFL, making the two-point conversion attempt a risky tactic; thus it is usually attempted only when two points will help the team but one point will not. For example, suppose that it is late in the game with a score of 21–10 and the losing team scores a touchdown, making the score 21–16. The scoring team will usually attempt the two-point conversion, because if successful, a three-point deficit later could be matched with one field goal; failure to convert would result in a five-point deficit that could be surmounted with another touchdown – a situation no worse than the four-point deficit achieved with a kicked extra point. Another example would be if a team scores a late-game touchdown, and as a result is down by two points. A successful two-point conversion would tie the game, and likely force overtime. In very rare and risky instances, a trailing team who scored a touchdown, and as a result is down by 1 point, may attempt a two-point conversion to gamble on a win and avoid overtime (or, under NCAA or NFHS rules, a subsequent overtime period). Two famous examples of this gamble were by Nebraska in the last minute of the 1984 Orange Bowl (unsuccessful) and by Boise State in the first overtime of the 2007 Fiesta Bowl (successful). Note that under NCAA rules, teams are required to "go for two" starting with the third overtime procedure. Under college and NFL rules, if the defensive team gains possession and advances the ball the length of the field into the opposite end zone on the try (for example by an interception or a fumble recovery, or by blocking a kick and legally recovering the ball), they score two points. This is officially recorded as a touchdown scored by the defense. The NCAA adopted this rule in 1988; the NFL added this in 2015. This scenario cannot occur under high school football rules; the ball is ruled dead and the try is over immediately when the defense gains possession. In the extremely rare event that the offensive team scores a safety on the try, it receives one point. In college football, this can occur when, for example, the defense gains control of the ball and attempts to advance it, then fumbles it out of bounds in its own end zone. Prior to 2015, only the offense could score a one-point safety in the NFL as the try ended once the defense gains possession. As of 2015[update], either team may score a 1-point safety due to the rule changes permitting the defense to return a try after a turnover. The game clock is not advanced during a try, however, the play clock is enforced. A delay of game penalty, false start, or similar penalty, by the offense results in a 5-yard penalty assessed for the try. Typically, penalties charged against the defense give the offensive two options: half the distance to the goal for the try, or assessing the full penalty on the ensuing kickoff. Since the try is not timed by the game clock, if a touchdown is scored as regulation time expires (and game clock subsequently reads 0:00.0), the try is still allowed to be conducted. However, after the Minneapolis Miracle, the NFL agreed to a rule that if a teams scores on the final play of the game, the PAT will no longer be conducted. This is only for teams that are down 1-5 points, or if the two teams are tied. However, if a team scores a touchdown on the last play of the game, and they are down by at least 6, the extra point will still need to be conducted, in order for the team that scored to win the game. During sudden-death overtime, particularly in the NFL, if a team scores a touchdown in the overtime period, the game is immediately over, and the try is not attempted. In NCAA overtime, if the second team to possess the ball in the overtime scores a touchdown which puts them ahead of the opponent in points the game ends immediately and no try is attempted. The officials' signal for a successful try, whether an extra point or a two-point conversion, is the same as for a touchdown. After the try, the team that scored the touchdown kicks off to the opposing team. In the WFL, PAT's were called "Action Points" and could only be scored via a run or pass play (as opposed to by kick as in the NFL), and were worth one point. The ball was placed on the two-and-a-half -yard line for an Action Point. This rule was a revival of a 1968 preseason experiment by the NFL and American Football League. The XFL employed a similar rule in which teams ran a single offensive down from the two-yard line (functionally identical to the NFL/NCAA/CFL two-point conversion), also for one point. By the playoffs, two-point and three-point conversions had been added to the rules. Teams could opt for the bonus points by playing the conversion farther back from the goal line. The uncommon safety is scored if a player causes the ball to become dead in his own end zone; two points are awarded to the opposing (usually defending) team. This can happen if a player is either downed or goes out of bounds in the end zone while carrying the ball, or if he fumbles the ball, and it goes out of bounds in the end zone. A safety is also awarded to the defensive team if the offensive team commits a foul which is enforced in its own end zone. A safety is not awarded if a player intercepts a pass or receives a kick in his own end zone and is downed there. This situation, in which the opponent caused the ball to enter the end zone, is called a touchback; no points are scored, and the team that gained possession of the ball is awarded possession at its own 20-yard line. If the interception or reception occurs outside the end zone, and the player is carried into the end zone by momentum, the ball is placed at the spot of the catch and no safety is awarded. A safety is signaled by a referee holding both palms together above the head, fingertips pointing upwards. After a safety, the team that conceded the safety kicks a free kick (which may be a punt, place kick, or drop kick) from its 20-yard line. A free kick (see above) may be taken on the play immediately after any fair catch of a punt. In the NFL, if the receiving team elects to attempt this and time expired during the punt, the half/overtime is extended with an untimed down. The ball must be held on the ground by a member of the kicking team or drop kicked; a tee may not be used. (High school kickers may use a tee). This is both a field goal attempt and a free kick; if the ball is kicked between the goal posts, three points are scored for the kicking team. This is the only case where a free kick may score points. This method of scoring is extremely rare, last successfully completed in the NFL by Ray Wersching in 1976. It is only advantageous when a team catches a very short punt with very little time left. Note that a team is unlikely to be punting with only a few seconds left in a half or overtime, and it is rarer still for punts to be caught near field goal range. The officials' signal for a successful fair catch kick is the same as for a field goal. The game is officiated by a crew of three to seven officials. Every crew will consist of a referee, who is generally in charge of the game and watches action on the quarterback and in the offensive backfield; an umpire, who handles spotting the ball and watches action on the offensive line; and a head linesman, who supervises placement of the down box and line-to-gain chains. The crew may also consist of a line judge, back judge, field judge and side judge, in the order listed: i.e. a crew of five officials has a referee, umpire, head linesman, line judge and back judge. Officials are selected by the teams in advance or appointed by the governing league. While the majority of officials at lower levels only officiate games on a part-time basis, the NFL is implementing a new system where seven officials will become full-time employees of the league, one for each official position (i.e. back judge, field judge, side judge, etc.). In the other three major North American professional sports leagues – Major League Baseball, the NBA and NHL – officials are employed by their respective leagues. The sheer volume of games in the other three sports necessitates full-time officials; the NFL regular season is only 16 games long, compared to 162 games for MLB and 82 for the NBA and NHL. During the game, the officials are assisted in the administration of the game by other persons, including: a clock operator to start and stop the game clock (and possibly also the play clock); a chain crew who hold the down indicator and the line-to-gain chains on the sideline; and ball boys, who provide footballs to officials between downs (e.g. a dry ball each down on a wet day). These individuals may be provided by the teams involved – it is common for a high school coach's son or daughter to act as ball boy for the team. It is a common misconception that the term "penalty" is used to refer both to an infraction and the penal consequence of that infraction. A foul is a rule infraction for which a penalty is prescribed. Some of the more common fouls are listed below. In most cases when a foul occurs, the offending team will be assessed a penalty of 5, 10 or 15 yards, depending on the foul. Also, in most cases, if the foul is committed while the ball is in play, the down will be replayed from the new position (for example, if the offense commits a foul on a first-down play, the next play will still be first down, but the offense may have to go 15 yards, or farther, to achieve another first down.) But if a defensive foul results in the ball advancing beyond the offense's first-down objective, the next play will be the first down of a new series. Some penalties (typically for more serious fouls), however, require a loss of down for the offense; and some defensive fouls may result in an automatic first down regardless of the ball position. In all cases (except for ejection of a player or, in rare cases, forfeiture of the game), the non-offending team is given the option of declining the penalty and letting the result of the play stand (although the Referee may exercise this option on their behalf when it is obvious), if they believe it to be more to their advantage. For some fouls by the defense, the penalty is applied in addition to the yardage gained on the play. Most personal fouls, which involve danger to another player, carry 15-yard penalties; in rare cases, they result in offending players being ejected from the game. In the NFL, if a defensive foul occurs after time has expired at the end of a half, the half will be continued for a single, untimed play from scrimmage. Under college rules, any accepted penalty when time has expired at the end of any quarter results in an extension for one untimed down. In the NFL, with three exceptions, no penalty may move the ball more than half the distance toward the penalized team's goal line. These exceptions are defensive pass interference (see the discussion of that foul for more details), intentional grounding, and offensive holding – but in this last case the exception pertains only if the infraction occurs within the offensive team's own end zone, in which case an automatic safety is assessed (intentional grounding from the end zone also carries an automatic safety). Under college rules, the same half-the-distance principle applies, but any offensive fouls involving contact in their end zone (e.g. holding, illegal blocking or personal fouls) result in a safety. Note: The neutral zone is the space between the two free-kick lines during a free-kick down and between the two scrimmage lines during a scrimmage down. For a free-kick down, the neutral zone is 10 yards wide and for a scrimmage down it is as wide as the length of the football. It is established when the ball is marked ready for play. No player may legally be in the neutral zone except for the snapper on scrimmage downs, and no one except the kicker and the holder for free kick downs. Each team receives three timeouts per half (if the game goes to overtime, each team receives additional timeouts), making for a total of six timeouts per team in a regulation game. Unused timeouts may not carry over to the second half or overtime. In professional football, a team must have at least one remaining timeout to challenge an official's call. In the NFL, a number of rulings can be reviewed by officials or challenged by coaches. If a coach wants to challenge a play, he must do so before the next play begins, and he does so by throwing a red flag similar to the officials' yellow flags. Coaches are allowed two challenges per game and are granted a third if their first two are successful. The team loses a timeout if they lose the challenge. Therefore, they cannot challenge if they do not have timeouts. Plays within the two-minute-warning and overtime cannot be challenged; any review must be initiated by a replay official off-field. The referee performs the actual review via a video screen on the sideline. The referee will announce the result of instant replay reviews over his wireless microphone. Beginning in the 2011 NFL Season, an instant replay review by the booth official will now be automatic for every play ruled by the referees on the field to have scored points. This is seen as another step in the "modernization" of sports. Every scoring play will be reviewed now, which saves coaches from using up their challenges on close plays in the endzone. And since the 2012 season, the booth official also reviews all turnovers during the game. In college, coaches are allowed one challenge per game by first requesting a timeout. Otherwise, a replay official in the press box observes all plays. If he deems a ruling may be in error, he notifies the officials on the field to interrupt the game before the beginning of the next play. The replay official performs the review and relays the decision to the referee, who announces the result. Not every conference employs replay, which is optional. High school rules do not provide for video review of any decisions by officials during the game. Further, the use of television or video tape for coaching purposes during the game is prohibited. If a coach feels a rule has been misinterpreted, he may call timeout and request a coach-referee conference to discuss the ruling with the referee, but no replay equipment will be consulted during the conference. Modified sudden death: if the team possessing the ball first scores a field goal, the other team is given one possession to win with touchdown or continue the game by scoring a field goal. In the regular season, only one 10-minute overtime is played and games may end in a tie. Postseason games play unlimited 15-minute periods until there is a winner. Each team is given one possession from its opponent's twenty-five yard line with no game clock. The team leading after both possessions is declared the winner. If the teams remain tied, another overtime is played. Starting with the third overtime, teams are only allowed to attempt two-point conversions after a touchdown. Games may not end in a tie. Coaches are issued two challenges to request a review for all other plays. A third challenge is awarded if both are successful. Plays during the final two minutes of each half and all overtime periods are subject only to booth review. All turnovers and plays ruled on the field to have scored points are automatically reviewed regardless of game time. Coaches are not allowed to challenge in either situation and are assessed an unsportsmanlike conduct penalty if they attempt to do so. Each coach receives only one challenge. If that challenge is successful, a second challenge is allowed. All plays are subject to booth reviews. ^ "The Unofficial Beginner's Guide to Football". Archived from the original on November 5, 2013. Retrieved October 1, 2012. ^ "Vikings, Packers Play To Tie". ESPN. Associated Press. November 23, 2013. ^ "Postseason overtime rules". NFL.com. Retrieved December 9, 2017. ^ Battista, Judy (December 9, 2017). "N.F.L. 's New Overtime Rule Means Extra Choices" – via NYTimes.com. ^ "NFL changes regular-season overtime to match postseason overtime". March 28, 2012. ^ "Texans outlast Jaguars in amazing overtime finish". ^ "What's different about NFL overtime this season?". SBNation.com. Retrieved December 9, 2017. ^ "Patriots vs. Falcons - Game Recap - February 5, 2017 - ESPN". ESPN.com. Retrieved December 9, 2017. ^ "WFL Rule Changes". Retrieved December 27, 2017. ^ Bell, Jarrett (April 2, 2008). "Coin toss switch tops list of NFL rule changes". USA Today. Retrieved September 28, 2010. ^ "NFL moves kickoffs to 35 yard line; touchbacks unchanged". Retrieved August 15, 2011. ^ 2007 Official Rules of the NFL. Triumph Books. October 1, 2007. ISBN 978-1-60078-028-8. ^ Stuart, Chase (November 15, 2016). "More NFL Teams Are Going For Two — Just As They Should Be". ^ "NFL Rules Digest: Try". Retrieved February 4, 2014. ^ "NFL Rulebook, rule 11-3-2.c". Retrieved September 21, 2015. ^ "Carl Johnson named NFL's first full-time game official". ^ "What You Need To Know About The New NFL Rule Changes – 2011".